Left to right: Sharain Jones, assistant project archaeologist; Katherine Couttreau-Robins, assistant project archaeologist; Laird Niven (with buckets), project archaeologist; Corey Guye (in foreground), archaeological team. This is likely the site of the Blucke house, where Acker Brook runs into Birchtown Bay. The 1998 excavation was the third archaeological project in Birchtown. 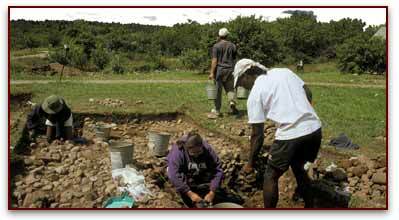 The Black Loyalist Heritage Society, formerly the Shelburne County Cultural Awareness Society, sponsored the first archaeological project in 1993 and the first archaeological publication in 1994. © Nova Scotia Museum 2001.